Pacific Northwest Ballet’s production of Giselle is a dream for any dance enthusiast or historian, but it’s also a moving, accessible introduction to nineteenth-century ballet for a dance neophyte. Filled with well-rendered tragedy as well as gorgeous dancing and moving performances, this Giselle is a painstakingly crafted period piece that gains gravitas from its historical sources. But, more than that, it’s simply a beautiful production. Jérôme Kaplan’s new costume and scenic designs are worth the pre-performance hype, and they create the ballet’s dual worlds, pairing the sunny, charming peasantry with the eerie, gothic forest of the Wilis. Opening night on Friday, May 30, featured a rockstar cast: Kaori Nakamura transcendent in the titular role, a few performances shy of retirement, Jerome Tisserand a dashing and grieving Albrecht, and Carrie Imler a deadly and beautiful Myrtha. Pacific Northwest Ballet soloist Jerome Tisserand as Albrecht, principal dancer Kaori Nakamura as Giselle, and company dancers as the ghostly Wilis in Giselle. One thing that PNB does right is to flesh out all the details of the story, which can seem so old-fashioned, even downright silly. Giselle, a peasant girl fond of dancing, loves Albrecht, a duke disguised as a peasant to court Giselle. In truth, Albrecht is engaged to the noblewoman Bathilde, and when this comes to light, Giselle—who coincidentally has a weak heart—goes mad and dies. That’s Act I. Act II sees Giselle join the ranks of the Wilis, the vengeful spirits of brides-to-be led by Myrtha, who seduce men into dancing to their death. Albrecht, grief-stricken, visits Giselle’s grave, and it is only Giselle’s love that saves him from death. This much of the story is always there, but sometimes it’s not much more—as if too much narrative gets in the way of the dancing. PNB’s production, however, uses plenty of mime (with a handy guide included in the program), building a character drama that makes a well-rounded whole and adds context to the dance. The dancing is closely linked to the story-line, but it is lovely in and of itself. Nakamura’s Giselle was light and rambunctious in the first act, coupling deft balon with delicate footwork. Tisserand’s Albrecht conveyed his nobility through his clean lines and beats, even while he masqueraded as peasant. Everyone in Act I had plenty of batterie—indicative of the folksy setting—and the corps de ballet of vinegatherers and friends performed with gusto and admirable unison. In the Peasant pas de deux, Leta Biasucci and Jonathan Porretta sparkled with exuberant but understated virtuosity. Both of their variations included fiendish brisée volée sections, as though they were holding a competition to see who could get more air; Biasucci and Porretta both know how to fly. Although the Peasant pas is essentially a divertissement, the sweetly romantic duet provided a dramatic foil: they were the happy dancing couple Giselle and Albrecht can never be. 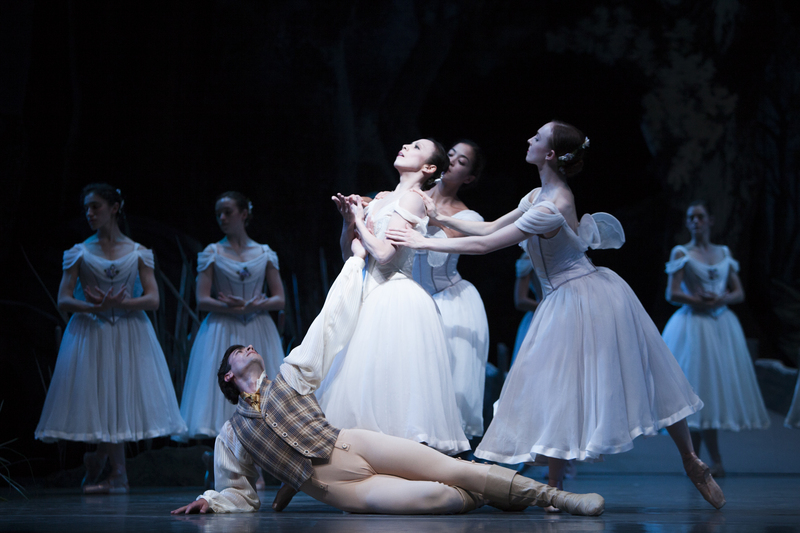 Pacific Northwest Ballet principal dancer Kaori Nakamura as Giselle, and soloist Jerome Tisserand as Albrecht, with company dancers in Giselle. Act II presented a stark change in setting, with its ghostly Romantic forest par excellence, complete with a stone ruin in the distance. Act II surpassed Act I with an emotional depth that pervaded the dancing. Imler made an ideal Myrtha, commanding the stage with strong (but never harsh) gestures and wafting jumps. Even on the ground, she may as well have been floating: in the iconic Myrtha entrance, Imler bourréed across the stage with an eerily still upper body, her feet rippling underneath her so quickly that their movements were almost imperceptible. While Myrtha was menacing on her own, the corps de ballet of Wilis was more menacing en masse, especially when they swarmed their victims. Wearing matching expressionless faces and downcast eyes, the corps (led by demi-soloists Margaret Mullin and Liora Neuville) performed in super-human unison. Only one moment marred this vision, when the audience applauded so loudly that the dancers could not hear the orchestra and the two sides of the stage were briefly off. Nakamura underwent a complete transformation: as a Wili, she became a wisp tossed about by the wind, or by Myrtha’s commands. She danced more furiously than she did in life, as though making up for lost time. Tisserand got more meaty choreography in this act (he must dance almost to death, after all), and he delivered with impeccable jumps that increased in showing his exhaustion but never decreased in technique. He is a fine actor; his grief was utterly believable as he partnered the incorporeal Giselle. As the leads, Nakamura, Tisserand, and Imler are all the kinds of dancers who can convey complex emotion in a simple gesture—the longing in an arabesque, the grief in a jump, the threat in a bourrée. This production focuses on well-rounded characterizations, thanks, in part, to the complete narrative. Some Giselles verge on the scared-little-girl stereotype, but Nakamura played Giselle as a more believable young person: flirty, sometimes (but not always) demurring, and just a little careless. Her mad scene showed hints of her anger at Albrecht, providing a touch more backbone to her personality. Sarah Ricard Orza’s Bathilde seemed less a rival for Giselle than another young woman in love with Albrecht; it’s easy to forget that Albrecht deceives not one woman, but two. This production retains the original ending, where Giselle’s last action is to bless Albrecht’s marriage to Bathilde, and the final tableau saw Bathilde holding his hand as he lay at Giselle’s grave—rounding out the noblewoman’s character. Also notable were Batkhurel Bold’s Hilarion (although Bold’s regal demeanor on stage is more suited to Albrecht than to the peasant Hilarion) and William Lin-Yee’s Wilfride, Albrecht’s sensitive squire. 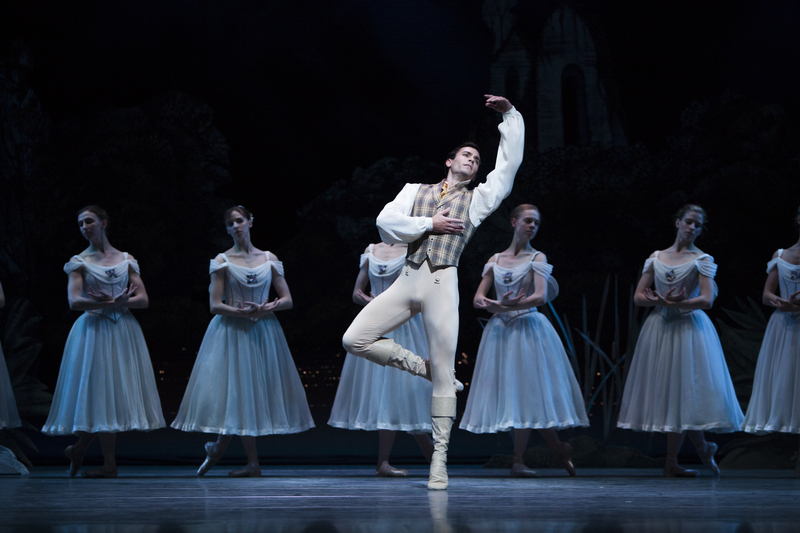 Pacific Northwest Ballet soloist Jerome Tisserand as Albrecht, with company dancers in Giselle. PNB’s Giselle is an achievement of many dimensions. Building on the robust structure of Adolphe Adam’s pretty music and the Coralli/Perrot/Petipa choreographic tradition as staged by Peter Boal, the stunning new costumes, sets, and memorable performances revitalize the work for a new generation. The depth of the work would not have been possible without Doug Fullington (choreography reconstruction) and Marian Smith (historical advisor), who drew from both French and Russian sources on the ballet to recreate the historical narrative. The result of all these elements is a ballet that is operatic in its tragedy. The story may be strange, but the characters are fleshed out, and the world brims with life even when its inhabitants are beyond the grave. Dance enthusiasts, bring your uninitiated friends. They will be moved. Pacific Northwest Ballet’s Giselle runs at McCaw Hall through Sunday, June 8. Tickets and information at pnb.org.